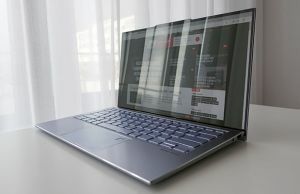 Summary: The UX430 is not just another Zenbook, it's a Zenbook on steroids, with a larger and excellent display, a great keyboard, fast hardware, long battery life and quite capable speakers. Despite those, it's not very expensive, so it should cater well to the average consumer looking for a compact and light all-rounder around the 1G mark, that can also tackle some games. It's not without flaws though, but none are real deal-breakers, as you'll find from the article below. 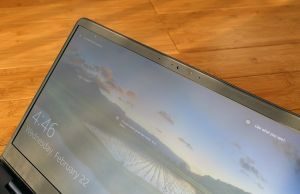 Back in early 2015 Dell launched the XPS 13 version that stunned many, including myself (I bought one and still use it today), with its compact footprint and minuscule bezel around the screen. 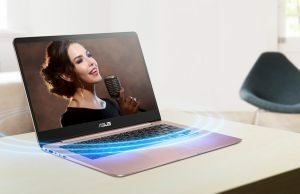 It took most other OEMs about two years to get on board with this approach and squeeze bigger screens in their laptops, and in this article we’re going to talk about one of Asus’s models, the Zenbook UX430 series. 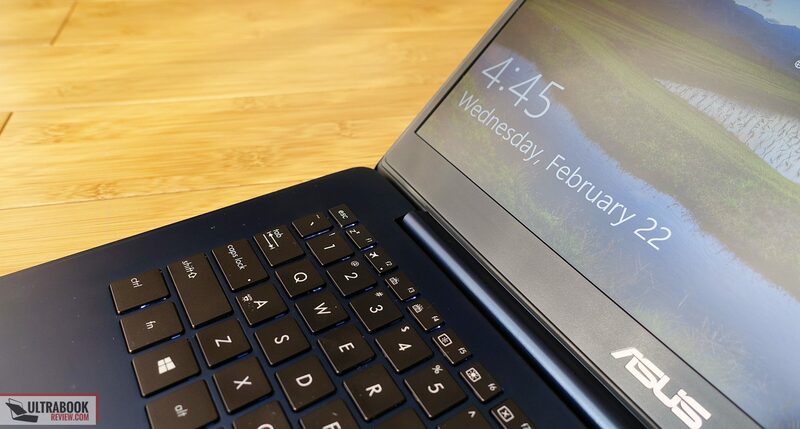 These laptops are about the same size and weight as the Zenbook UX330 we reviewed in 2016, yet as the name suggests, comes with a bigger 14-inch screen, plus a slight design twist and dedicated Nvidia graphics on some versions. The UX430 line is available in two main variants at the time of this post, the UX430UA without dedicated graphics, and the UX430UQ with Nvidia GT 940MX graphics. The two are otherwise identical, sharing the same chassis, screen or battery, so the decision between them is based on how often would you play games and whether you’re willing to spend a little bit extra for the UQ model. 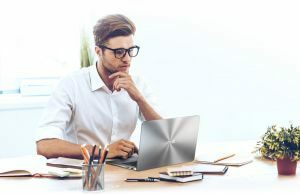 Update: If you’re reading this article in 2018 or later, check out our review of the updated Zenbook UX430 series with 8th gen Intel processors and Nvidia MX150 graphics. 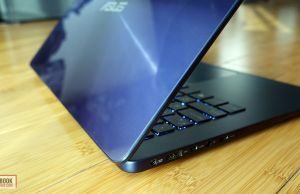 Our review analyses the Zenbook UX430UQ variant and we’ll get in depth on all its bits and pieces below. However, mostly everything in this post stands for the UX430UA models as well, in case you’re interested in one of those instead. 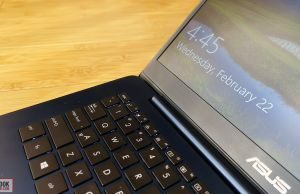 a Zenbook UX430UN with the same specs, but also Nvidia MX150 graphics, with a list price of $1199 in the US, but only available in select locations (Costco, at the time of this update) – more details. We reviewed the Zenbook UX430UN in this detailed article. Except for the performance section, everything else mentioned in this article applies to these newer models as well. 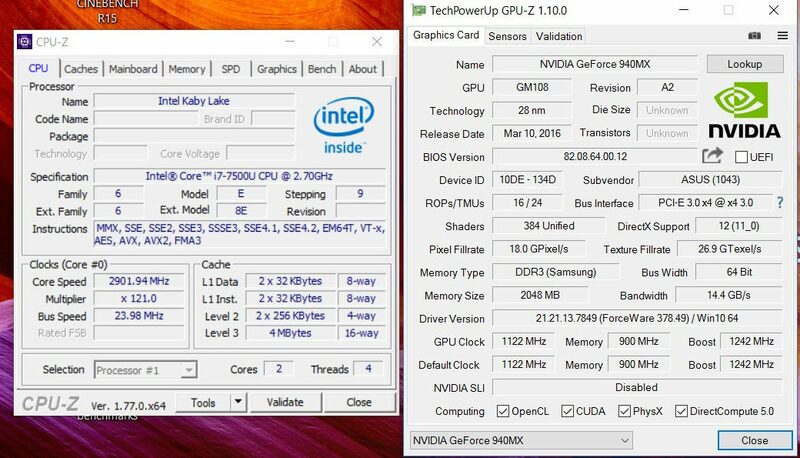 You can follow this link for more details on how the quad-core Core U processors compare to the older dual-core models, as well as this one for details on the performance of the Nvidia MX150 chip. 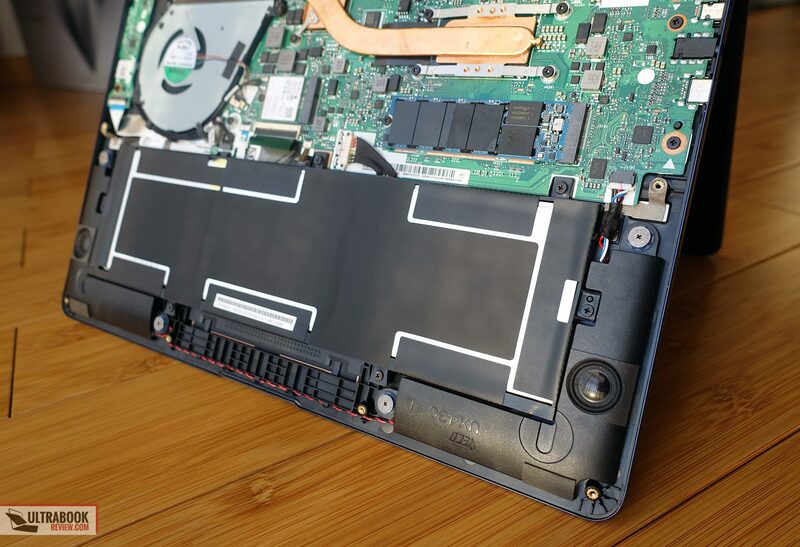 There are three main things you should know when it comes to the build of this laptop. 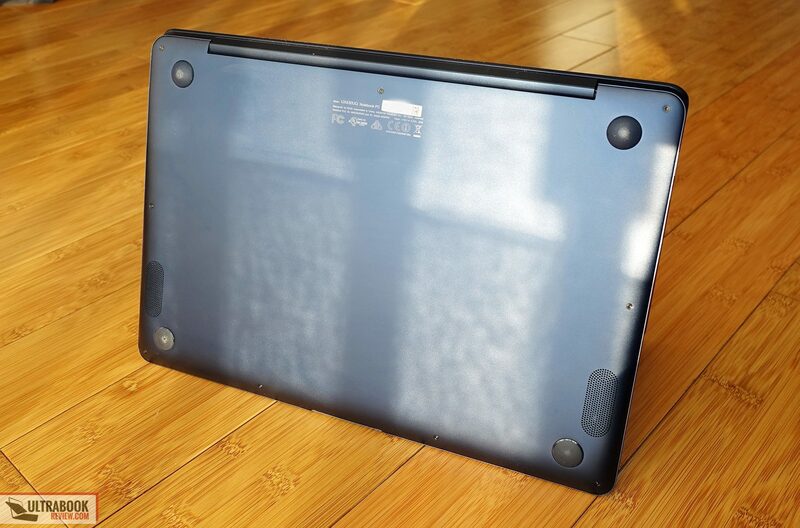 First of all, its case is mostly made out of aluminum sheets put on top of a plastic inner frame, so it feels fairly sturdy, yet there’s more flex in the keyboard deck and especially in the lid than on some other Zenbooks and more premium alternatives from other OEMs. That’s because some of the UX430s don’t get an aluminum hood, like most other Zenbooks, which is the second point of interest here. In fancy marketing terms, the lid is covered in “a stunning crystal-like coating that’s created using an advanced technique known as nano-imprinting lithography (NIL)”. The technology is explained here, but in real-life terms, this translates in a type of glossy surface that looks and feels like glass, but is not as fragile or shock-sensitive as glass. 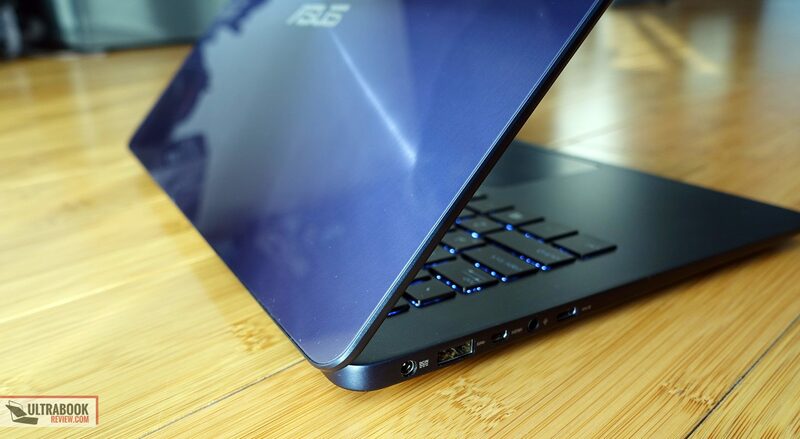 So in fewer words, this Zenbook gets a glossy and flexible lid, one that shows smudges and fingerprints easily. However, not all UX430s get the NIL coating, but only the Royal Blue (the one tested here, which kind of looks closer to violet for me) and the Rose Gold options. There are also Quartz Gray and Shimmer Gold models, available with standard brushed aluminum lid covers, and personally I’d pick between one of these over the NIL coated models, as they should be a little stiffer and a lot easier to keep clean. Anyway, on to the third aspect: this Zenbook is compact, thin and light. 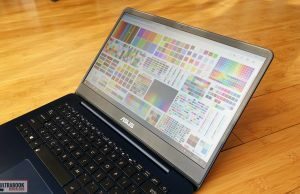 It’s the same length and width as a standard 13-inch Asus Zenbook and it weighs 2.75 lbs, but actually packs a 14-inch display instead. 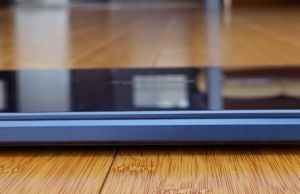 The bezels are thin on the right and left sides, yet not as thin as on the XPS 13, plus the top edge is actually large enough to accommodate the camera and microphones, so you don’t get that annoying framing in your calls that I get with the XPS. Overall I feel that Asus did a good job here, finding a good balance between narrow bezels and usability. Speaking of that, let’s see how the UX430 feels in daily use. It’s easy to grab, hold and use, thanks to its reduced weight and blunt edges. 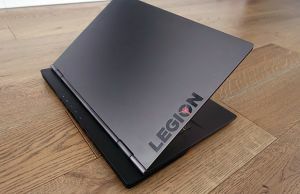 However, just like on other Zenbooks, the bottom panel doesn’t attach perfectly flush with the main deck, it goes in a little too much and leaves a hard edge around, just enough to bite when grabbing the laptop. Now, perhaps the final release versions will be a little better polished, but given this is not the first time I run into this issue, I wouldn’t hold my breath for it. This aside, I appreciate the crease on the front lip that gives the right grip to lift up the screen, but then you can’t do it with a single hand anyway, as the hinge is too stiff to allow that. At least the hinge seems to be well built from what I can tell from a quick look at its inner mechanism, with metallic brackets attached directly onto the metallic interior, and not onto the plastic inner frame. 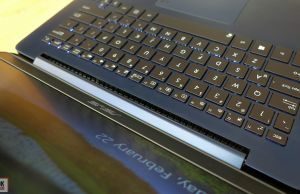 I can’t comment on the part behind the plastic hinge cover, but I haven’t seen many complaints about it breaking recently (like on older Zenbooks), so I can at least hope Asus addressed this design flaw. 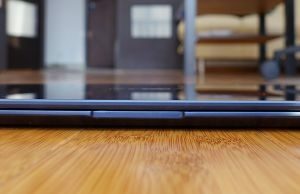 The laptop’s interior is simple and gets the feeling you can expect from a matte anodized aluminum surface: something in between smooth and rough. The palm-rest is generous enough, with the keyboard above and a large trackpad straight in the middle. More about these in a bit. 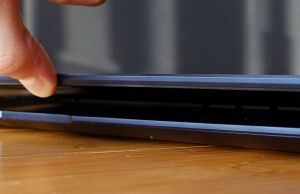 For now, let’s quickly turn this Zenbook upside down and have a look at the bottom, where there are four rubber feet and two speakers grills, but no intake cuts. Like on many other Zenbooks, the exhaust and air intake grills are placed behind the hinge, which is a solution that has worked fine in the past and works fine here as well. Last but not least we have to mention the IO on this laptop, which is decent, but could be better. Most of the connectors are on the left edge (PSU, USB 3.0, USB 3.1 Type C, micro-HDMI and headphone jack), with an extra USB 2.0 slot and the SD card-reader on the right, next to some status LEDs. However, I believe Asus should have squeezed in a full-size HDMI connector on this laptop, i think there was enough space to fit one, but they didn’t and you’ll need a micro-HDMI to HDMI dongle to output video. Besides this, there’s no Thunderbolt 3 support either, as that USB Type C port only support gen 1 speeds (5 Gbps). 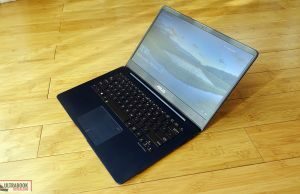 Overall, the Zenbook UX430 leaves me with mixed feelings. It’s compact, light and looks nice when you take it out of the box. 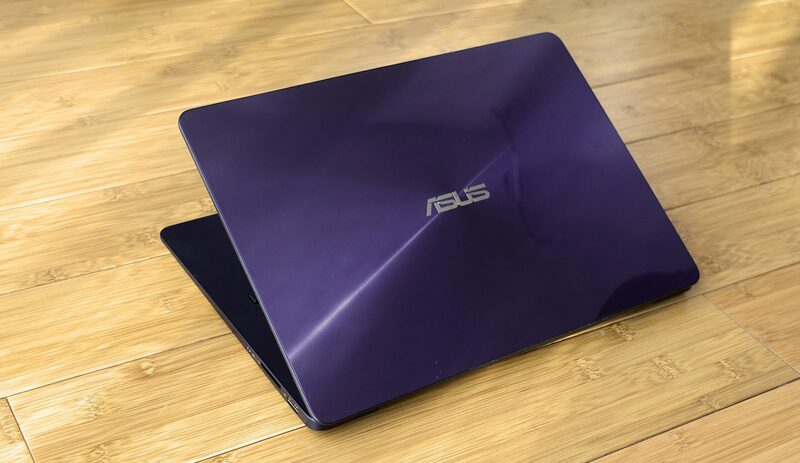 I’m definitely not a fan of the flexible glossy NIL lid cover, but Asus offers options with a standard metallic hood as well. There’s no way around the somewhat limited IO though or those sharp bits on the underbelly, pesky to those of you with softer hands. 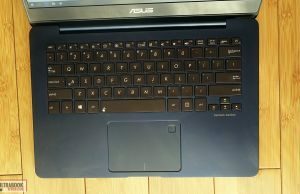 I was quite happy with the keyboard on this laptop and it really looks like Asus managed to get keyboards right on their latest Zenbooks. The layout hasn’t changed in recent years and still includes the Power button as the top right key and smaller directional keys, but that aside it’s pretty much flawless, with 15 x 15 mm square keys and proper spacing between them. What has changed is the feedback though. 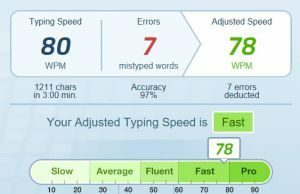 These keys have an average stroke depth (1.4 mm), but their coating, resistance and click suit my typing style very well, so I ended up typing quickly and with very few mistakes from the first minutes I got my fingers rolling on them. 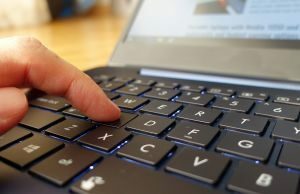 The keys are also quiet and backlit, with three brightness levels to choose from, so overall this keyboard is one of the better you can find on a mid-range ultraportable right now. The trackpad is fairly good as well. It’s made out of glass, so it’s smooth, and it’s slightly recessed into the frame, so you can easily find it in the dark. And while it is a Microsoft Precision trackpad made by Elan, it actually performed flawlessly. 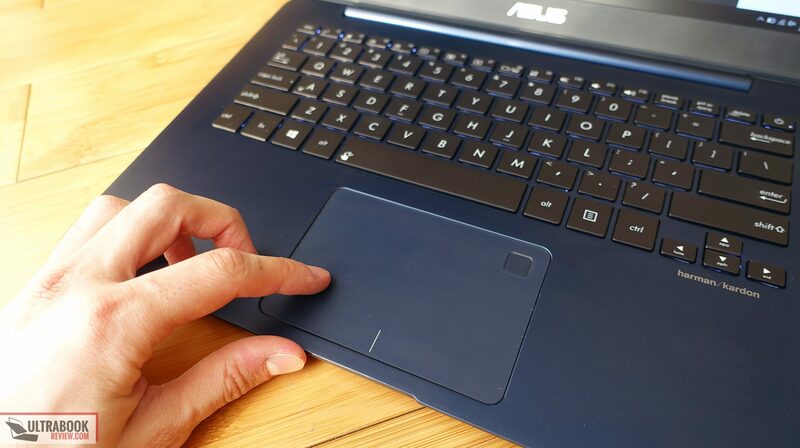 This trackpad looks identical to the one the Zenbook UX390 and I was afraid I would run into the same issues I ran when I tested that laptop, but I actually didn’t. I haven’t noticed any glitches with gestures or the cursor jumping and dragging, like on that one, nor did I encounter jumpiness when holding one finger on the surface and moving it with another. 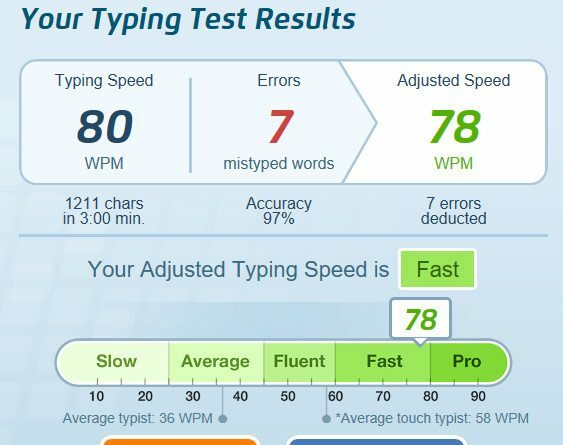 So I can’t tell if I was lucky with this test sample or Asus actually managed to finally implement a solid trackpad, but I really can’t complain. 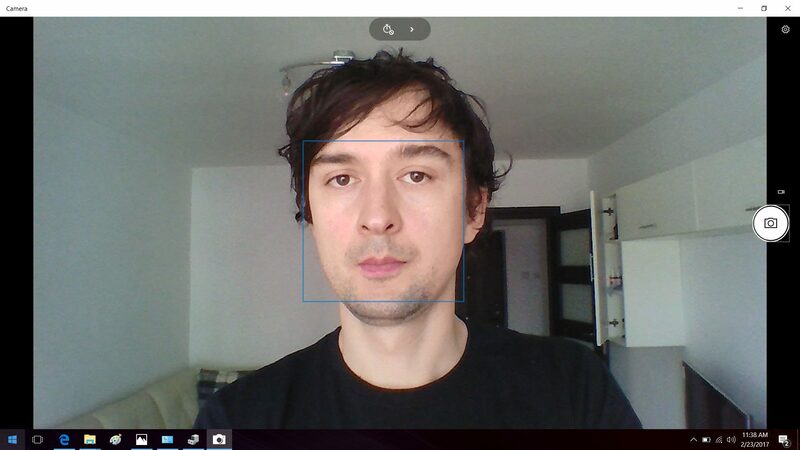 Even the physical clicks are decent, a little stiff and noisy, but better than on many other implementations. 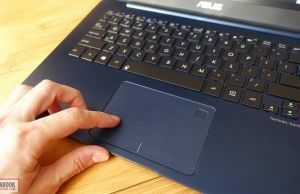 I should also mention there’s a fingerprint reader integrated within the trackpad, and while this might seem like a gimmick at first, it makes a lot of sense, as i’s actually a lot easier to log in in Windows by quickly placing the finger over the sensor than by typing that lengthy password each time. 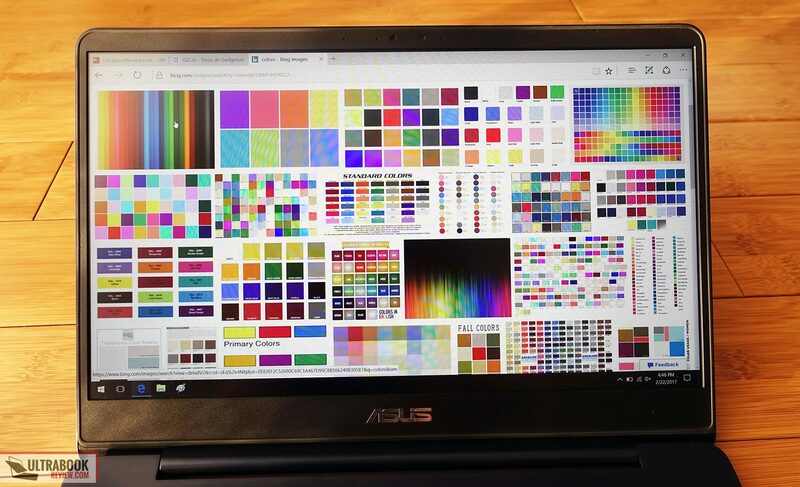 So this little gimmick is becoming a feature I would actually love to have on my next laptop. 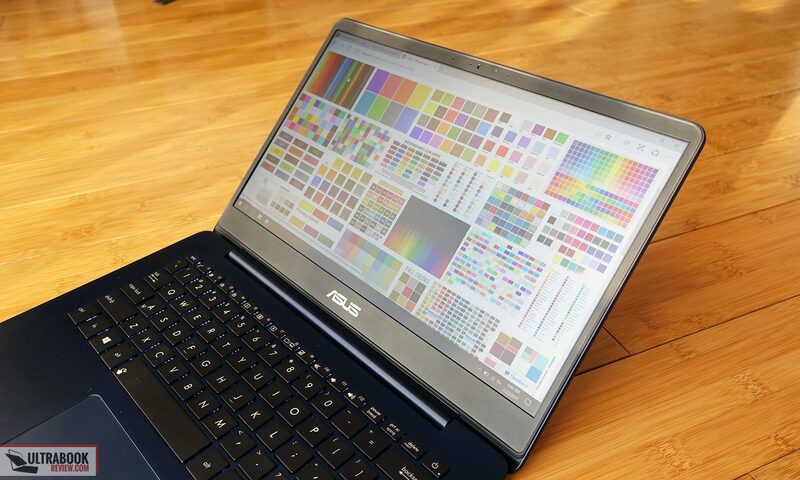 Asus puts a 14.0-inch screen on the UX430s and actually, quite an excellent one. It’s a matte non-touch IPS panel with a resolution of 1920 x 1080 px, which for me is a perfect combo: no glare, no reflections and just sharp enough to allow me to even use it at 100% scaling if I wanted a large canvas (still, I kept it at 125% most of the time). The panel is made by Chi Mei and it offers solid brightness and contrast, ample viewing angles and quite accurate colors out of the box. 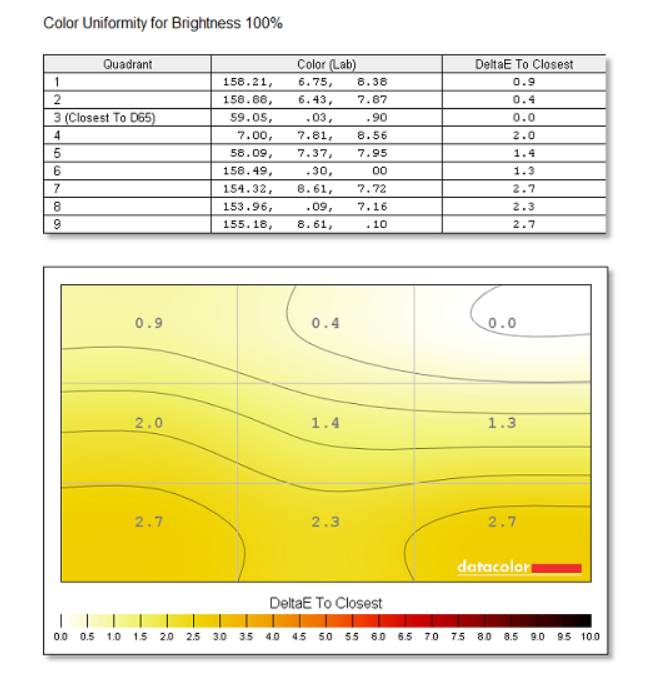 It does have a slight blue tint and gamma distortion, but you can use our calibrated color profile to address them. More on the technical details below. Average DeltaE: 1.17 uncalibrated, 0.83 calibrated. I will also add that the screen leans back to about 145 degrees, which is enough for desk and even lap use in most cases. I would have still preferred it to go all the way back, but at least it goes further than on some other modern Zenbooks. 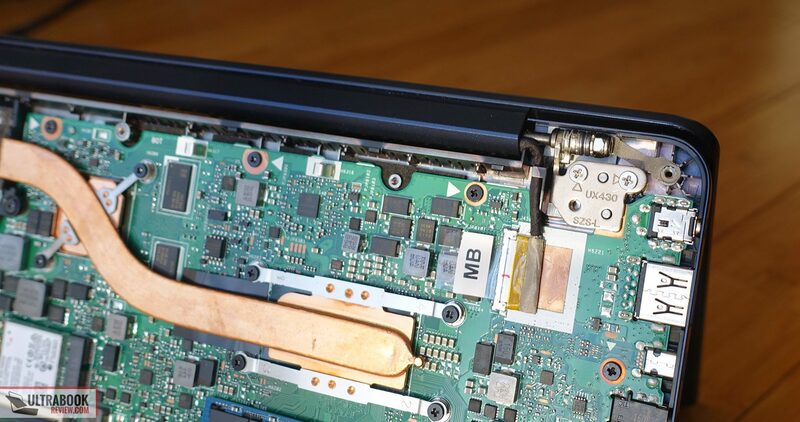 You should also know there’s a light sensor on this laptop, placed on top of the screen and active by default, and it can cause the screen to continuously adjust its brightness in darker environments. 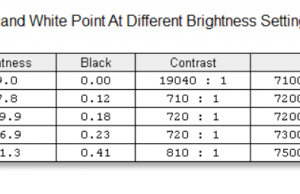 I prefer to turn it off (FN+A) and set the brightness manually. Our test model is the top configuration Asus offers for this series, with a Core i7-7500U Kaby Lake processor, 16 GB of DDR3 RAM, a 512 GB M.2 SATA 3 SSD and dual graphics: Intel HD 620 and Nvidia GT 940MX with 2 GB of GDDR3 memory. 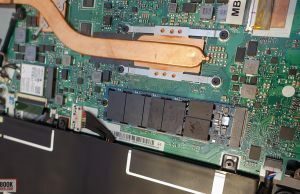 The storage and Wi-Fi chip are the only components upgradeable, and in order to get to them you’d have to get past the panel on the underbelly. It’s a fairly simple task, just be aware that it’s hold in place by Torx T4 screws lined around the edges and two more Philips screws hidden beneath the rear rubber feet. Once you unscrew those, work your way in with a plastic pry tool (or old credit card), starting from the back. Performance wise, the Kaby Lake Core U platform can handle plenty, from all the basic daily chores to serious multitasking, heavy browsing and even more demanding programs like Photoshop, Eclipse or Premiere. 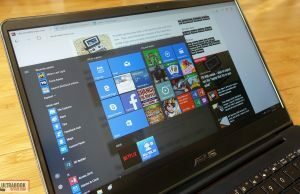 There’s some bloatware preinstalled and you should get rid of it (or do a clean Windows install) in order to get the most out of the hardware. 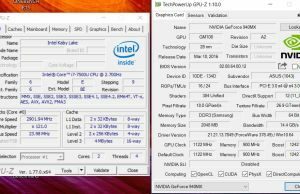 I’ve ran a few benchmarks and you can find the results below, as well as some pics that will show you what to expect in terms of performance and temperatures while watching movies, browsing and playing games. Now, on to this laptop’s gaming abilities, it only comes with an Nvidia GT 940MX dedicated chip, which is pretty much a revamped version of the 3 year old Nvidia 840M chip, so it can’t really do much. It will handle older titles fine, but with those launched in the last 1-2 years you’ll have to seriously lower the details and even the resolution if you want to get decent frame rates (30 fps). 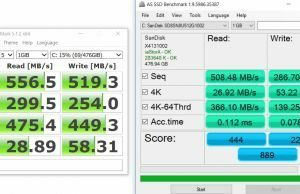 I’ve added some results below, and I’ve also included the Intel HD 620 chip for reference, just to show you what the Zenbook UX430UA models can offer in similar conditions, as well as the Nvidia 840M chip from the Zenbook UX303LN reviewed back in 2014. 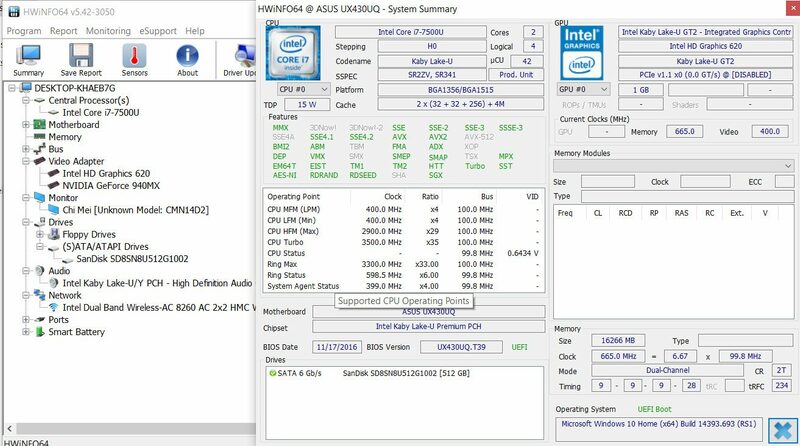 In other words, the 940MX chip does offer a 25-40% boost in games over the Intel HD 620 graphics integrated withing the Kaby Lake processor, and Asus actually charges a very small premium (around $50-$75) on UX430UQ model over a similarly configured UX430UA, and I believe that is worth paying for if you plan to run some games on this thing. However, the 940MX is still an old chip and I’d expect the UX430UQ series to be upgraded to Nvidia 1040 chips somewhere down the line (these are not yet released as of February 2017) and at that time it will be a far more capable gaming option. In the meantime though, if you’re interested in serious gaming on an ultraportable, you’d better have a look at the options in this article that covers the topic more indepth. There’s a fan inside this laptop, one a little bigger than on the 13-inch Zenbooks from what I can tell, because it has to cool the CPU and the GPU at the same time (they’re both on the same heatpipe). Not sure if the UX430UA gets a smaller fan, but It might. 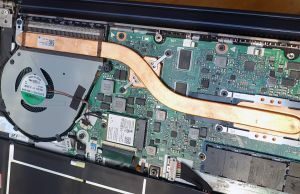 The thing is this fan is more aggressive than it should be, which has been the burden of this section in all my recent Zenbook reviews. That means this fan is active even with the most basic of tasks, despite the fact that the CPU runs at low temperatures and could be passively cooled. Now, it’s not very loud, so as long as you have some music in the background or watching a movie you’re not going to even hear it. But when browsing or typing in a quiet room, like I am right now, well, it will be there, constantly roaring. I agree I’m probably more sensitive to this type of noise than the average user, but I’ve gotten used to my XPS running silent with basic tasks and I expect all other laptops to do the same, especially when they’re bigger. 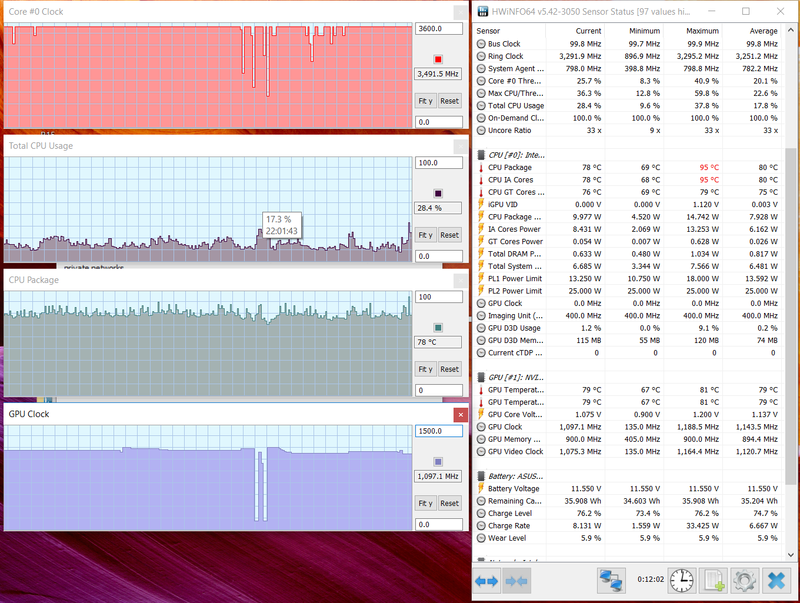 Anyway, as a result of the fan being active all the time, the UX430UQ remains very cool with daily use. However, this same fan doesn’t ramp up very much in games and demanding loads, and that causes the metallic body to get quite hot, to the point where playing games on your lap is not safe and to the point where your hands are going to get sweaty on the keyboard. 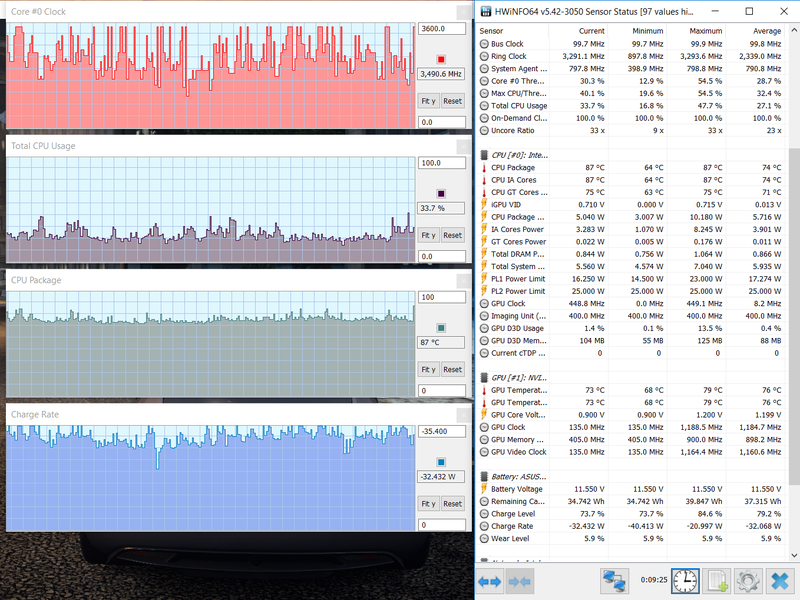 So overall I think the cooling system needs more tweaking. On one end the fan shouldn’t be active with light use, and that could be theoretically done with a BIOS update (don’t hold your breath for it, hasn’t happened on older Zenbooks), and on the other it should cool the hardware more efficiently at high loads (but that can only be addressed with a redesigned fan or cooling system altogether). Anyway, check out the temperatures below. As a side note, with the Nvidia chip disabled, load temperatures go down a little bit, but not as much as I would have expected. 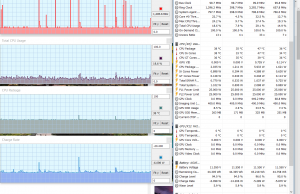 See below, that’s what you should expect from the UX430UA models (as long as it has the same cooling implementation). Connectivity wise there’s Wireless AC and Bluetooth on this laptop. 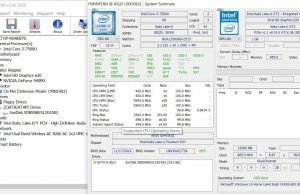 Asus went with a dual-band Intel 8260 AC wireless module which performed fine both near the router and at 30 feet with 2 walls in between. 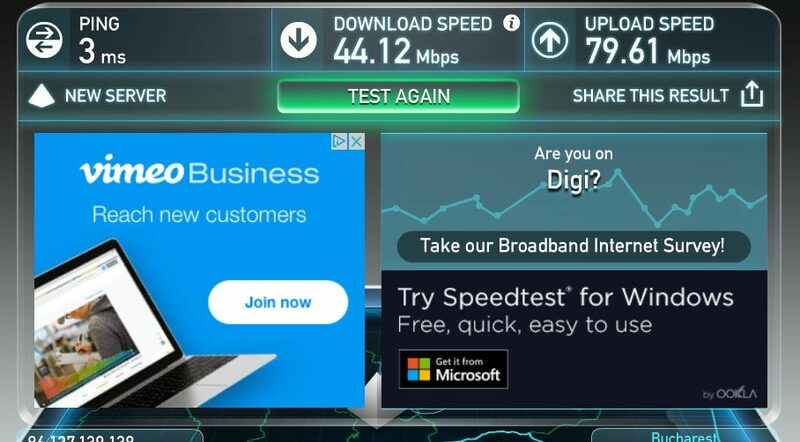 Not the fastest with my setup, but at the same time not something I can complain about, as I haven’t ran into any buffering or signal drops during the week I’ve spent with the laptop. The audio system on the other hand deserves some praises. It’s not spectacular by any means, but it’s fairly good for this class, as long as you choose the Music profile from the AudioWizard app that comes preinstalled (it’s active by default). They are placed on the bottom, but they’re not very easy to cover or distort even when using the laptop on the lap, and the sound coming out of them is quite good: 83 dB max volume, decent mids and even a little bit of bass (audible down to 85 Hz from my tests). 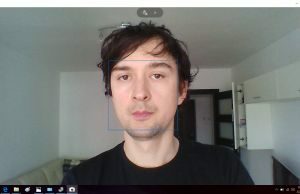 As for the webcam, I already mentioned it’s placed on top of the screen, flanked by microphones. It gets a wide angle and shoots decent enough pics in a properly lit environment. 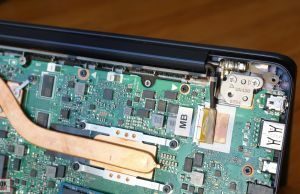 There’s a 50 Wh battery inside the Zenbook UX430UQ and that’s not bad, considering most other Zenbooks get a 48 Wh battery these days. 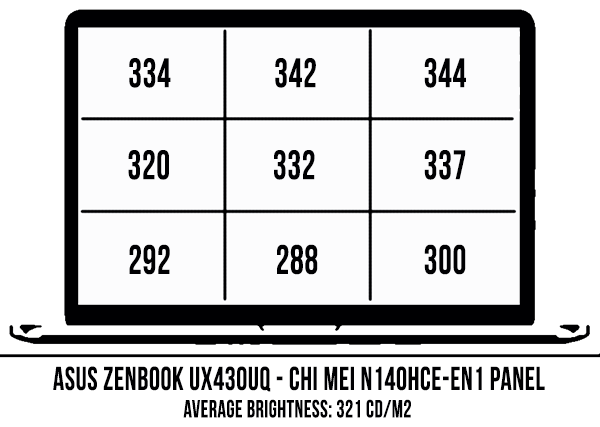 You’re not going to get much in terms of gaming, but otherwise the UX430 won’t dissapoint, as you can see from the numbers below. 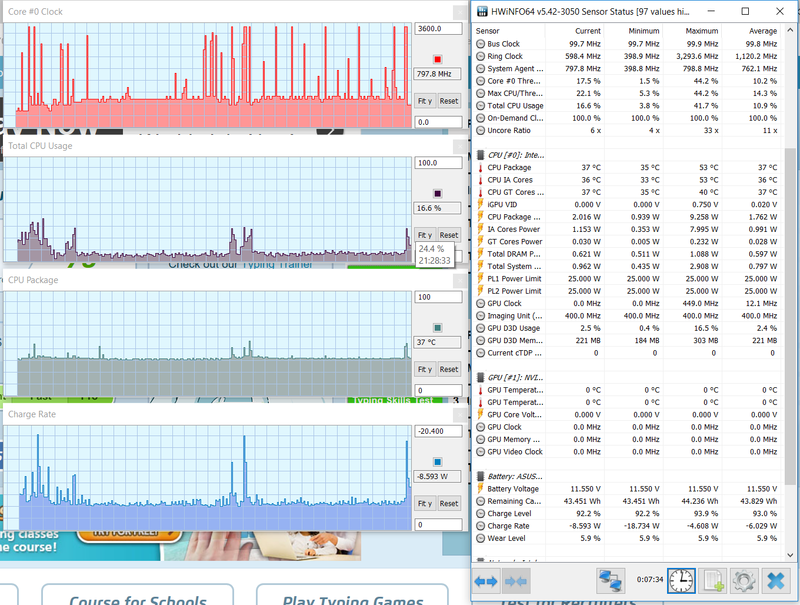 32.0 W (~1 h 30 min of use) – gaming, High Performance Mode, screen at 30%, Wi-Fi ON. This laptop comes with a 65 Wh charger and a full-recharge takes around 2 hours and 15 minutes. The wall plug is integrated withing the power brick, with non-retractable prongs, like on most other modern Zenbooks. The Zenbook UX430 series is available in most regions of the world at the time of this update. 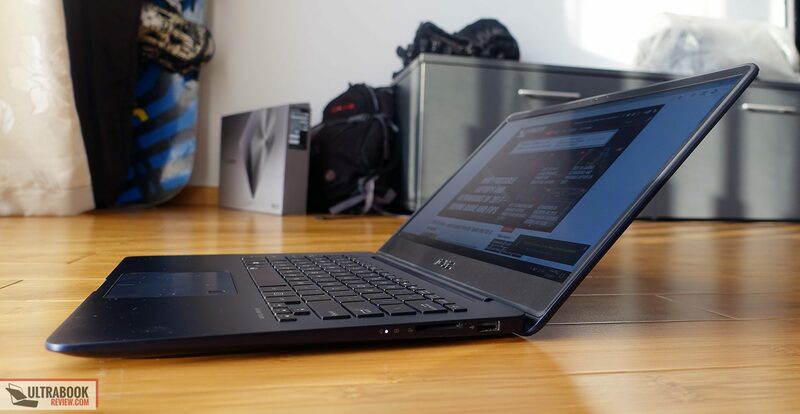 The UX430UA starts at around 999 EUR / $999 for a Core i5 configuration with 8 GB of RAM and a 256 GB SSD. 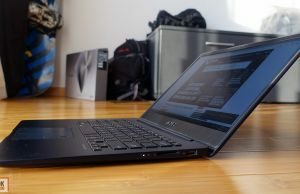 The top-end configuration includes a Core i7-8550U Core U processor, 16 GB of RAM and a 512 GB NVMe SSD, for around 1300 EUR in Europe and $1100 in the US. More details via this link. 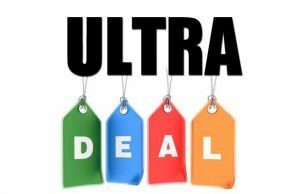 The updated UX430UN version gets the MX150 graphics and sells for around 100 EUR / $100 more than a similarly configured UX430UA model. You can still find the previous UX430UQ models with Nvidia 940MX graphics, and given their performance and the nicer screens, you shouldn’t look past them if you can get them for a good discount. 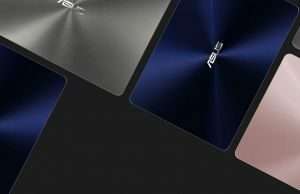 Just keep in mind that the variants Asus might actually offer in your region can vary, so follow this link for updated configurations and prices at the time you’re reading the article. 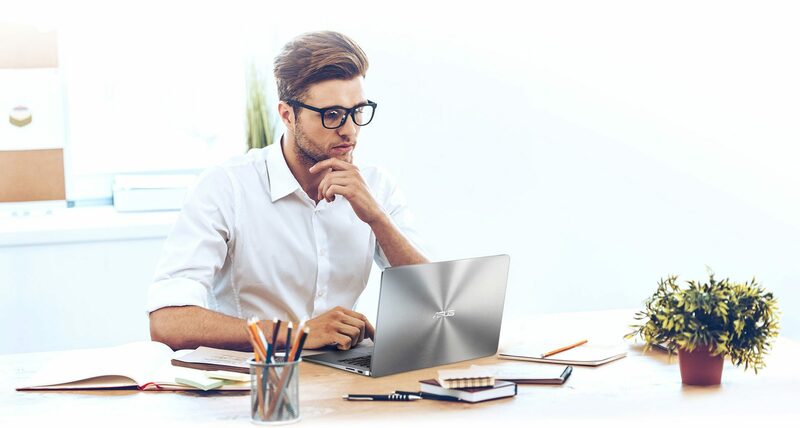 If you’re looking for an ultraportable and have around $1000 to spend, the Zenbook UX430 series should be on your list. 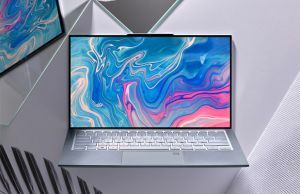 Personally, I would gladly pay a little extra for the larger screen tucked inside the body of a 13-inch laptop, with a metallic build, slim profile and light weight. Especially when that screen gets an excellent panel. On top of these, don’t forget this laptop performs well, offers good battery life and packs a great keyboard and trackpad. On the other hand, I’m not a big fan of the NIL glossy coating Asus uses for some color versions, glossy, flexible and prone to smudges, I don’t like that there’s no full-size HDMI connector and have to look for an adapter to output video, and I surely don’t like how the cooling system performs. 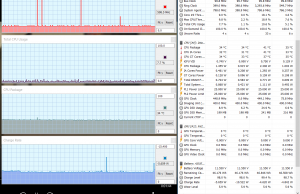 About that, if you’re looking at a Zenbook UX430UA without Nvidia graphics, those won’t get as hot under load as the 430UQ tested here, so you’ll only be bothered by the fan’s aggressiveness with daily use. There’s also the question of whether the UX430UQ model is worth paying extra for. 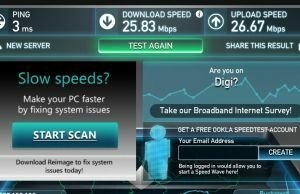 If you don’t want to play recent games on your computer, then the answer is no, but if you do, the small premium Asus charges for it is well worth it as the Nvidia 940MX chip does make a difference. It’s still an old design though, so there are many other faster options for you out there, yet not as portable. 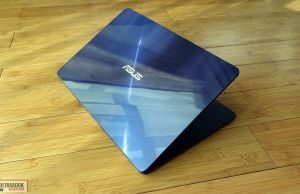 So at the end of the day, Asus did a good job with the Zenbook UX430s. 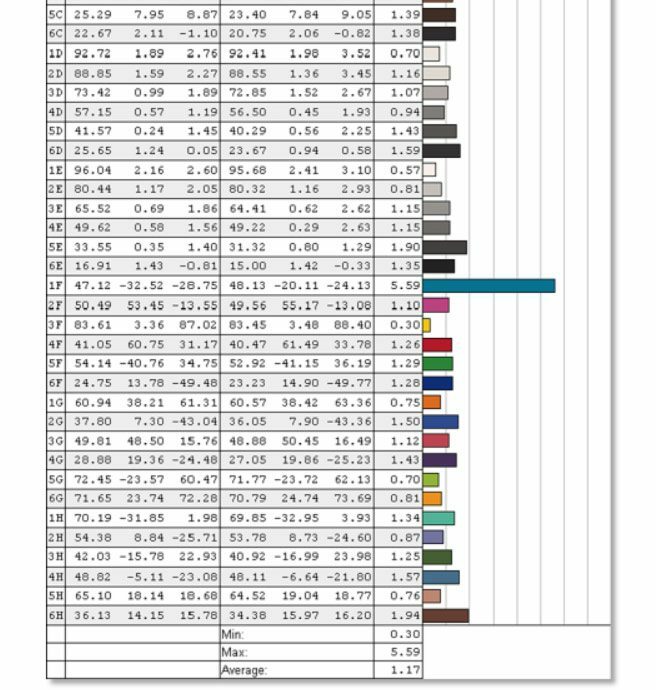 I do have some nits and complains and I do believe that a little better quality control and attention to details would have helped creating more solid products, but I’m also more picky than the average buyer so I’d expect most of you to be happy with one of these. 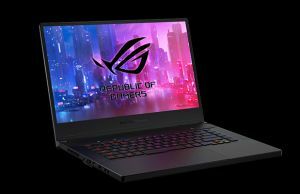 Alternatives you can consider in case the UX430 doesn’t get you what you need are the very similar MSI Prestige PS42, the Lenovo Ideapad 720s, or the highly portable Asus Pro B9440 or LG Gram 14, as well as some of the other thin and light options listed in this longer article. 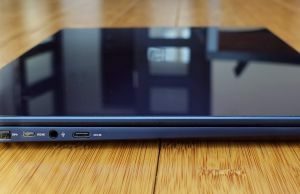 Get in touch if you have any questions or anything to add to this post, and let me know what you think about your unit if you decided to go for a Zenbook UX430. So I bought the UX430UN about a month ago from Costco when it was on sale for $999. Have been super happy with the battery life and the laptop. The fans are fine and do not bother me at all. I am also relieved that it is ok to let it run hot, as I was worried the heat might damage the battery while I game or something. Hey, does anyone know if the battery is user replaceable? In a couple years I was thinking I would probably have to change it out because it is only 3 cell and over time Li-ion batteries degrade. Idk I have never had a device long enough to be able to tell, so I hope the battery keeps running strong. Also, I was thinking about getting a fan/cooling pad to help keep the laptop cool. Does anyone recommend a good brand/ model? I am just worried about the heat, even though I have been told it doesnt damage I am still worried. I know. 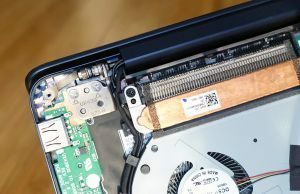 The battery can be replaced and it's a fairly simple task, but you do need a little bit of knowledge to get inside and unscrew the right screws and detach the right connectors. As for your last question, I've never used any, but you should go through the listing on Amazon/Newegg and find one with good user reviews. 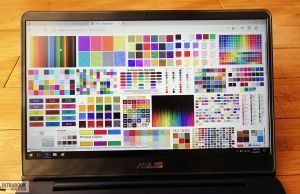 How do I apply your calibrated color profile file to my UX430, do I just click right and install ? If I do how do I revert back if my screen turns out to be different from your model number ? 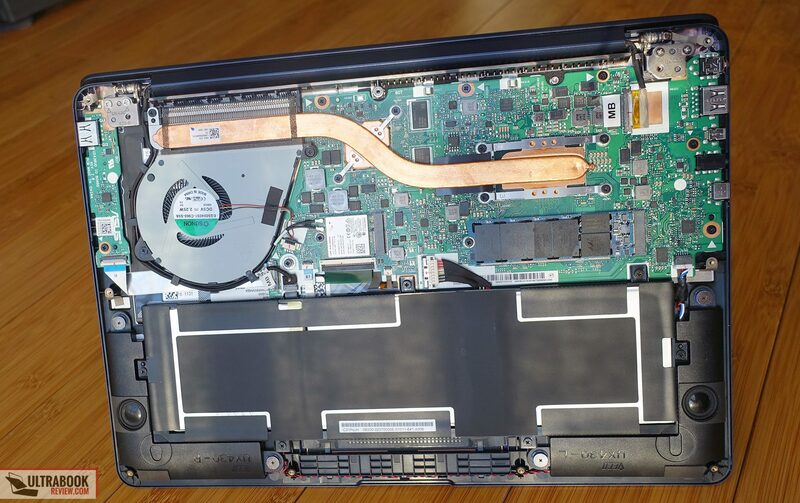 No fingerprints on the replaced laptop and touchpad more firmly in its socket. This time the finishing touch lacked from the screen – with a residue of clue like substance framing the LCD screen. After a couple of day´s use I have noticed there is a ultra light sound (like friction or electromagnetic "sparkles") coming from behind the screen when scrolling up and down a webpage. Any idea what might be causing that? Thanks in advance. This is a great forum! I had this laptop and returned after 3 weeks due to overheating and severe fan loud hissing noise. I tried many software solutions but noise stayed. I won't suggest to buy it. Now I have Lenovo T460s i7, 2k LCD, and very happy with it. 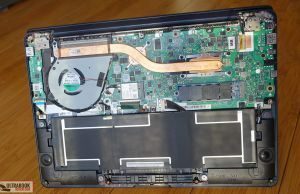 Almost no fan noise and no overheating; When intensive job laptop's fan noise bearly noticeable. 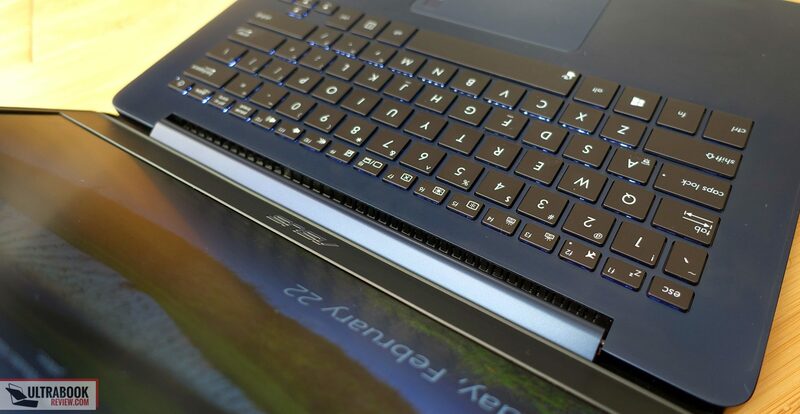 The keyboard of Lenovo T460s much better than Asus Zenbook UX430. 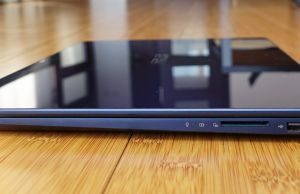 Altogether I suggest Lenovo T460s over Asus Zenbook UX430 even though T460s may be a bit expensive. The coil whine some of you are hearing, I believe it comes from the SSD. 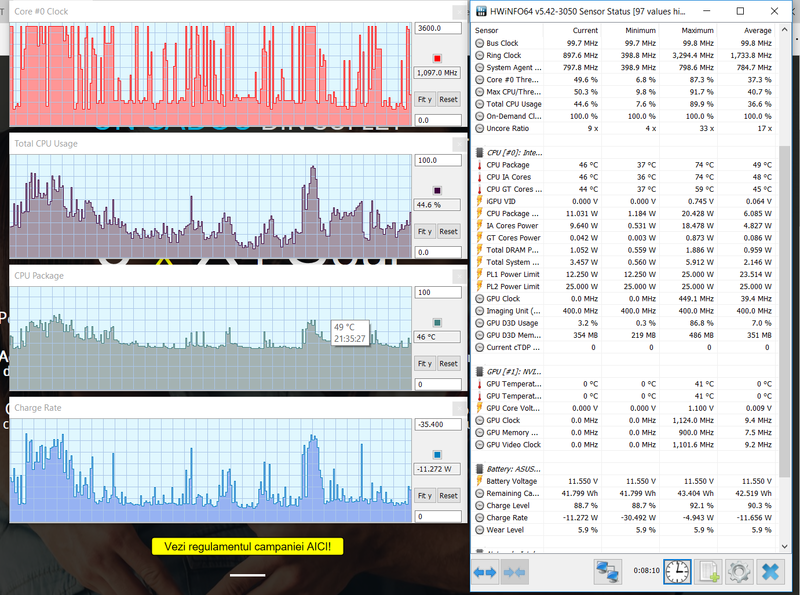 At least in my model, the ux430ua i7 with 512gb ssd, the noise comes from that exact location..
Hi, could you please do a calibration on the newer UX430UN model as I believe it is not the same Chi Mei panel. 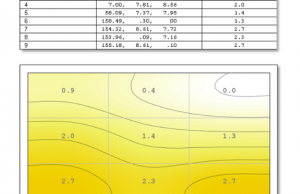 Much appreciated if a calibration file for the new panel can be shared. Many thanks! 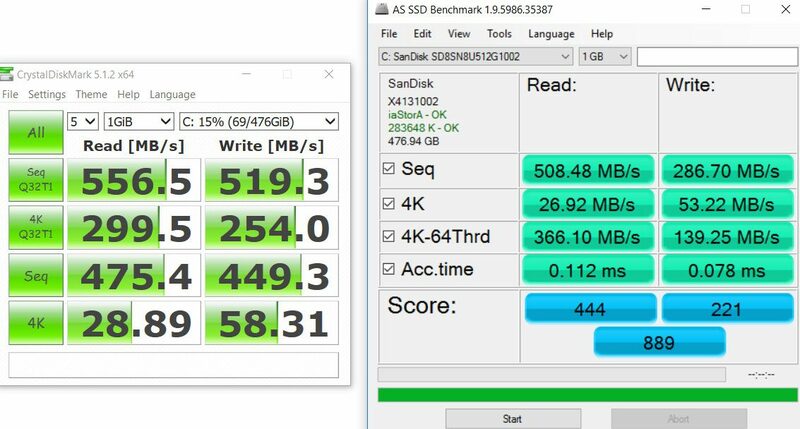 As for my model from Costco (i7 8550u, MX150, 512G/16G, $999), I use it mainly for development, and it is a great machine for my work. The keyboard feels comfortable for long typing as it feels kind of soft if you get used to it. The trackpad is excellent. Accurate and smooth and clicky. I don't need to use the mouse for most of the time. The specs support my work very well as I usually need to run a VM at the same time, so 512g of storage and 16g of ram really help. The screen is beautiful, as color coverage is decent and it's MATTE!!! Thank god. THE perfect combination for coding and text editing work! Again, it would be great if I can get the screen more accurate in color as I also do web design work. Many thanks! Hi, I'll have an article about the UX430Un up soon with that file included. Sweet! I am looking forward to it too! looking forward to the ux430un review soon too as the biggest turn off for this from what i've read are the severe thermal throttling (73deg) on the mx150 and the PWM flicker on the screen. 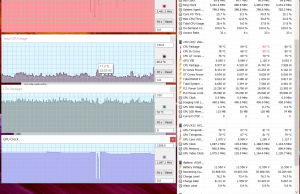 More bummed out about the 73 deg thermal limit on the MX150. Else, i would've gotten it in a heartbeat. Yeah, I would like to know the released date too. Did you ever get to finish the UX430UN review? Really informative review, thank you for the detailed and thoughtful analysis! I completely concur – well reviewed! 1. I often hearing the coil whine (a ultra light sound (like friction or electromagnetic "sparkles")) in a quite room or in nights. 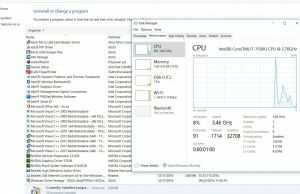 I cant find the source of noise with using Task Manager -> Performance tab. 3. Power cord and USB ports are so close to each other(on the left-upper side of notebook). Power cord connector is look like L and if you need to use USB port always, it makes a problem, because always you need to upturn your power cord connector. Hi, I recently bought two units of the UX430UA and both have different degrees of keyboard flex. I'm now thinking of returning one of them: would any of you have any advice with respect to which unit I should keep? The one with more flex (and keys that protrude higher from the chassis) or the one with the keyboard that has less flex and more recessed keys? I have no idea why the key travel on both units differs by a fairly noticeable amount. 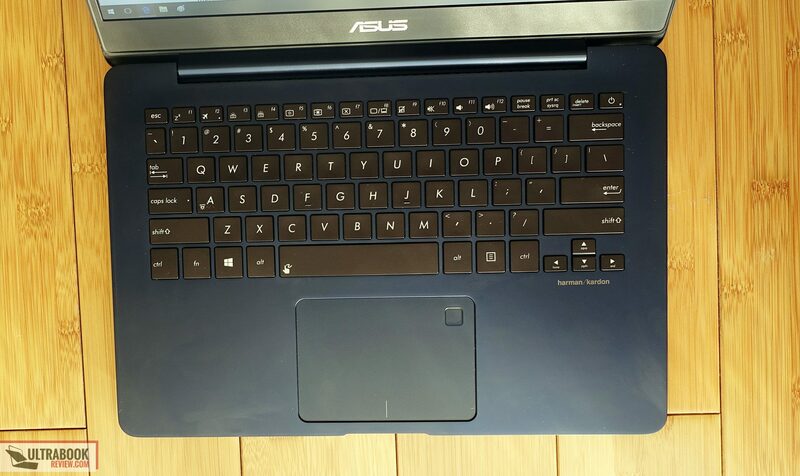 Guess Asus really does have quality control issues on this model. Disappointed to spend this much and get this in turn. Any help would be appreciated. 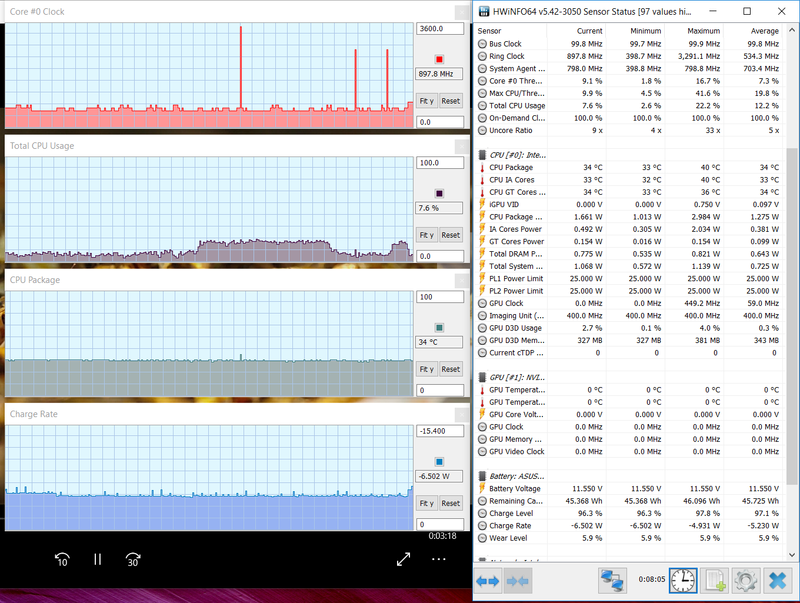 Iam using NoteBook FanControl since I bought this laptop,(mostly in read-only modus) and never had any problems with it. Thanks for the info, I will have a look at it. Would you care to elaborate a bit on how you set up Notebook Fan Control to work with your UX430. 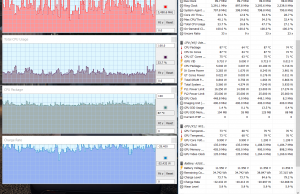 Mine seems to by default always at 12.5% fan speed, meaning its always on regardless of the temperature. 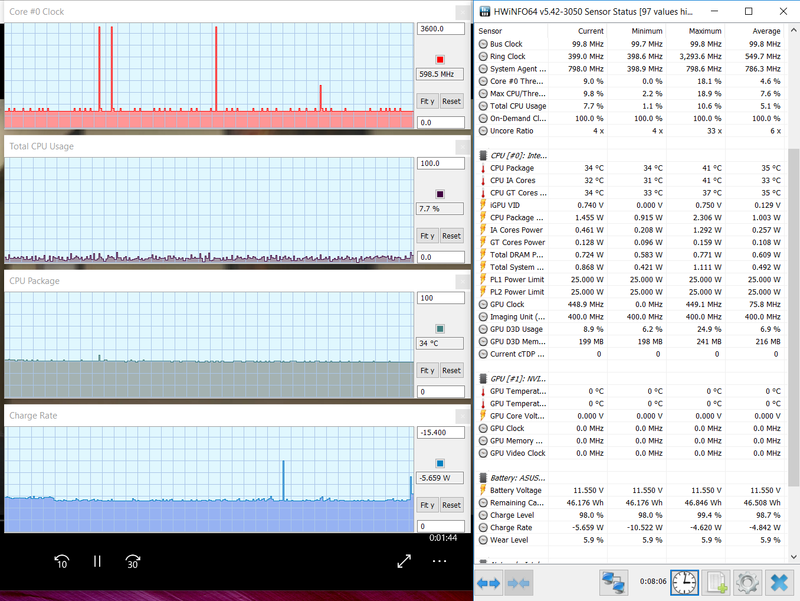 This translates to <40C at typical use (its with the 7th gen 7100U processor). When I enable the custom profile the fan shuts down, but it doesn't seem to follow the profile when the temperatures raise, its always off. The read and read/write options have no effect on the fan, only the enable. I couldn't find any guides on how to set up the Notebook Fan Control app and its profiles. Thanks. 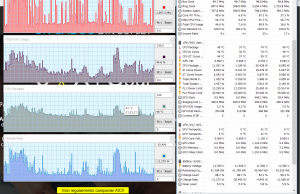 I have UX430 with i5 7200 and using FanControl 1.5.3. 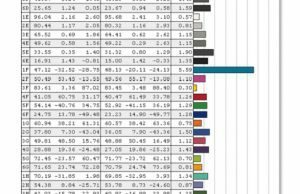 In this version I have preselected configurations for differents notebooks models. 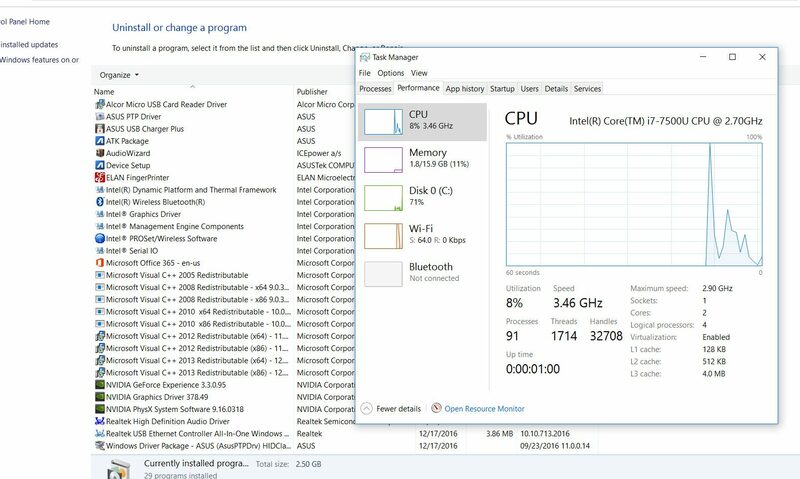 Iam using config for Zenbook UX310UA and it works well for me (fan is staying off until 45C i think, than ) I dont know if this will be fine also for your processor but you have a plenty of models to choose between in this version, so you can try some of them. 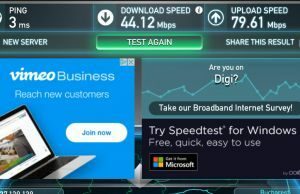 However, I tried the Spectre X 360, supposed to be better on many levels, and returned it, I did not like it that much as I am sensitive to fan and background noises, there is most of the time that hissing sound, although faint, but very high pitch, and sound quality and image quality are not as good as on the ux430ua. 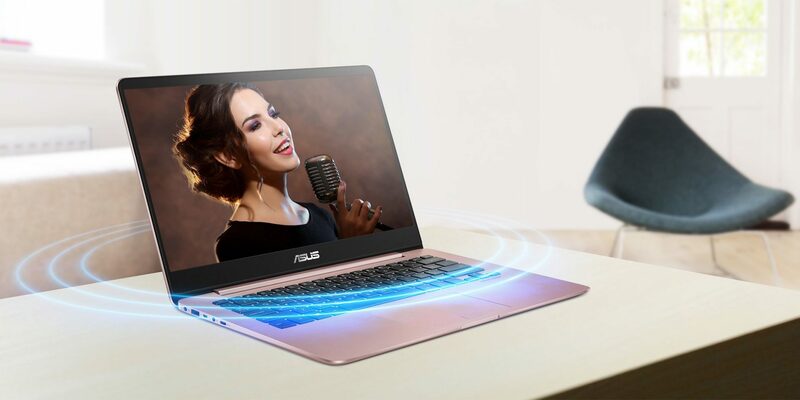 Not trying to 'sell' the ux430ua, but I have the impression that ASUS has corrected that fan noise problem we see on so many Zenbooks, at least on this one. What helps to increase battery life is to use the Microsoft Edge browser, not as hungry as Firefox or Chrome, for instance. 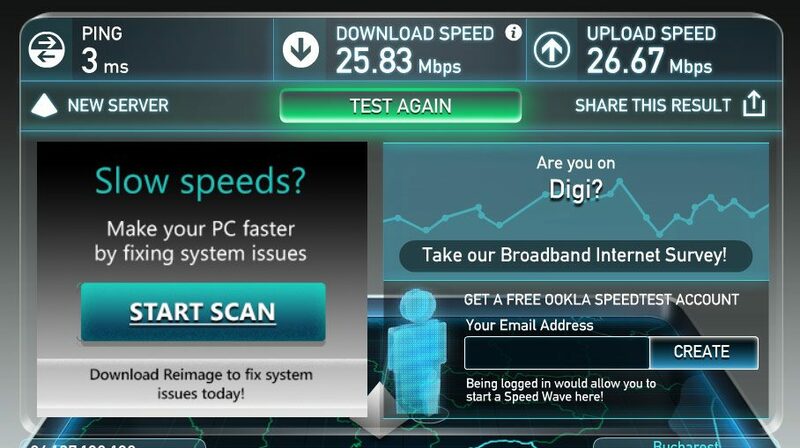 Does make quite a difference, especially when watching videos or Netflix! 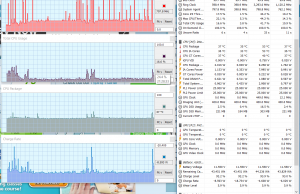 Yep, that's why we run our browsing battery tests in Edge. 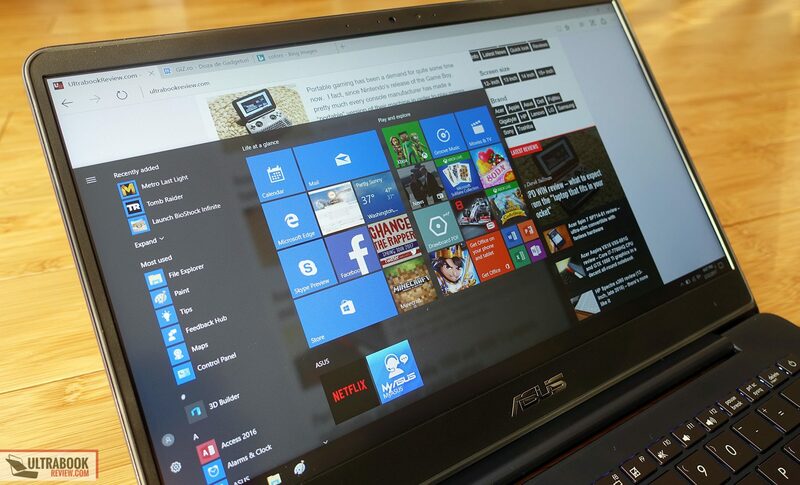 Can anyone share their experience with plugging a 4K monitor to this laptop? From ASUS support I know that HDMI is 1.4 version which has a limit of 4K at only 30Hz. Since there is no Thunderbolt, I suspect that the USB type C (gen 1) port will also be not powerful enough to output 4k 60Hz to a monitor. Don't buy this laptop! I got it last May, because at first, it was not noisy at all,one of my main criterias. 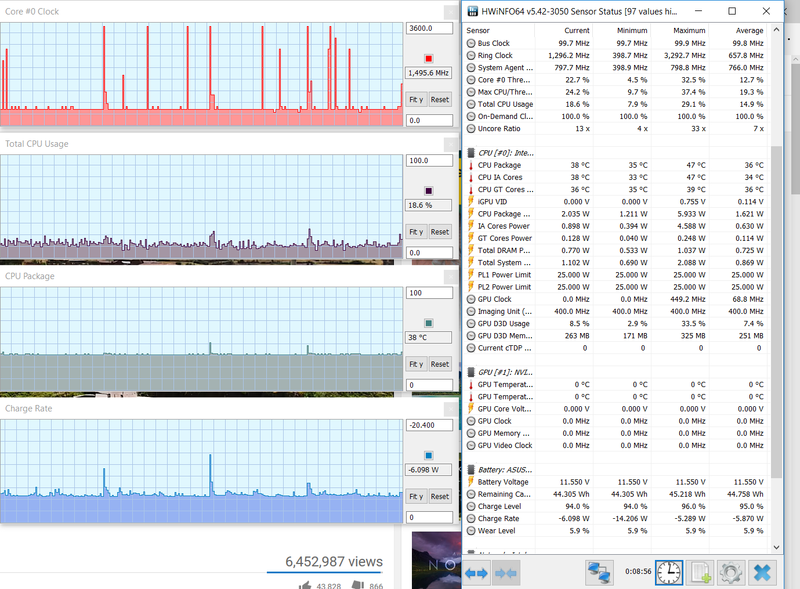 Has become noisy since December, I tried so many solutions to slow down the processor and fan, but to no avail. And it is full of bugs, such as with the wifi and with regular blank screens that appear. I am getting a Mac soon, as it seems that no PC is really quiet, except by Microsoft, but is too expensive for me. I have to add that also, the battery is rubbish. Lasted for a long time for the first months, but not anymore, even if I follow Asus' instructions on how to make it last longer, I also use Edge, less hungry. I won't last more than three hours even if I only use Word, not even the web! Very disappointed by this laptop, to say the least. Also, often, another bug make the keys completely mixed up, when characters that appear are not those I type! Light and compact laptop, but that's the only positive thing about it, what a crappy thing!